Absolute immersive cinema. It’s a hard feat, but Virtual Reality technology is facilitating full 360° spectacle and rendering the traditional cinema screen seemingly static. Needing only enough room to turn your head, local VR cinemas and production houses are springing up to support Australian filmmakers and actors in making the shift to more media formats. As with any new paradigm however, VR filmmaking comes with its share of challenges and new skills to be conquered and explored. As a novice to any Virtual Reality experience I was initially hesitant - there is something incredibly committal about voluntarily restricting your senses, particularly in a public space. Fortunately Michael Lyons, owner of Virtual Reality Cinema in Collingwood, was more than able to assuage my fears. “Consider [placing on the headset] like the light going down in a cinema,” he said “you are immediately immersed into the film or graphic world”. The cosy decor certainly helped lull me - a warm blend of tactile books and displays with space-age chairs and headsets. Only holding eight viewing seats at the moment, Michael clearly envisions the future of VR to be very personal. Forfeiting your sight and hearing to transport your mind to another world could feel like an intensely voyeuristic experience, where you disconnect from your body entirely, but this is not the case here. Despite a partnership with the Melbourne Fringe Festival I was privy to a private ‘screening’ - seemingly not a rare occurrence, but even hearing the rare movement reasserts an awareness of your blindness and disconnectedness. My first experience of VR film was a short, abstract piece called Ink and Colour by director Virginia O’Reilly. Designed to resemble roaming ink currents in water, the film places you at the center of a colourful sensory bombardment. As a purely abstract piece I was able to look around and catch glances of momentary fleeting beauty, similarly though Ink and Colour was over very quickly. While a visually stunning experience, a little longer to appreciate the sights would have been much appreciated, even if this meant simply slowing the ink movements. The next two shorts - a freeze-frame movie about a breakout and a time-lapse from a moving car - were similarly short but less memorable. Both felt like proof-of-concepts that worked to a degree, but failed to absorb me into the experience I was viewing. The technological constraints were also most apparent here - no camera movements, headset pixilation, existing inside a 360° bubble. Fortunately the last short I was able to see was Remember by Australian/Singaporean creators The Pulse. Immediately the production value surprised me, opening in a future cityscape I was placed in the perspective of a young woman watching my partner and child play. An A.I. walked my character (this was not interactive) through how to adjust and improve this memory, inserting greenery from other memories and removing a nearby train. Despite the notable pixilation from the headset the scene was gorgeous, with enough time to appreciate the actors, effects and scenery working in harmony. Whereas most movies feel like a moving painting, this truly felt like an immersive window into another world. The experience of shifting your own perspective, even if only to rotate, is extraordinarily powerful and imparts a real sense of location. As this story progressed I learnt about that had defined my character, her friends while she studied, how she met her partner, all through her own eyes. And I learnt about her world and what happened to lead her here through her own eyes. If movies can impart sympathetic emotions successfully, then it is hard not to be empathetic here - there was no exposition, this felt like a private story in a private world. This privacy makes it difficult to discuss the film with only traditional cinematic language though - my experience feels inherently isolated. One solution to this isolation Michael suggested was a ‘group VR’ experience currently under development, in which other viewers appear in the movie with you. This could be used to show someone riding a rollercoaster or similar with you, maintaining a sense of position and reducing isolation. Of course there need to be facilities to view experiences like this however, and that requires some agreement on what pieces of rapidly-evolving technology are consistently used. Similarly there are inconsistencies on whether experiences should be monoscopic (one screen, simple to film) or stereoscopic (an independent screen for each eye, more difficult but greater depth perception). Even the typical 360° bubble is called into doubt, as Ana Serrano of the Canadian Film Centre says “360° is seen as a gimmick, far less important than the storytelling elements”. “Many content creators see 180°-200° as the ideal ratios to present VR”. Michael laughs and disagrees that this is a problem, “you can still look behind you in a cinema, it doesn’t mean you expect to see anything”. When asked how filmmakers can control their viewers eyes then and keep them focused where the director wants he says, “it’s a different approach for filmmakers, you need different skills”. He currently help run a workshop/access program designed to discover and equip “2D and real-time artists” with those skills. Most of his content constitutes dance, music videos or documentary style content - all non-interactive - but is very open to exploring new paths. “I can’t name names, but we’re currently working on several behind the scenes projects to be released alongside feature films” he says proudly. 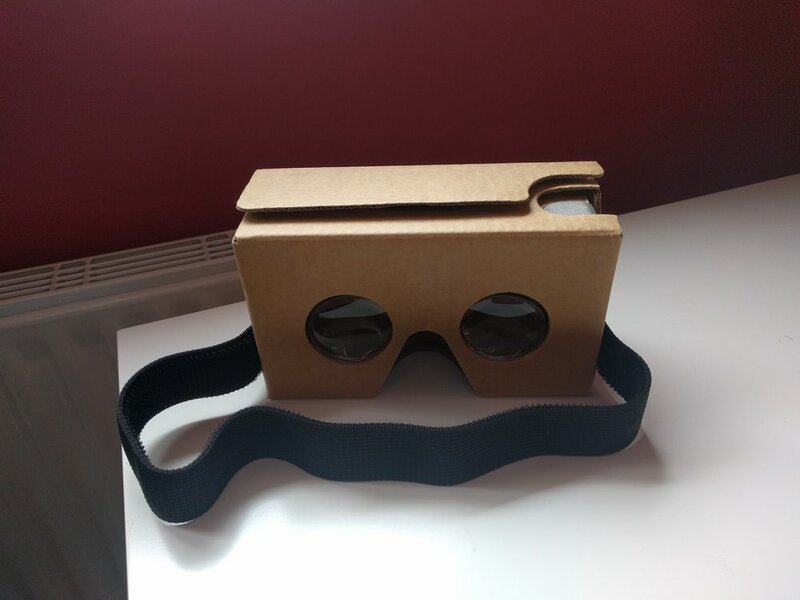 To understand how people would get hold of these experiences I tracked down a model of Google’s own ‘Cardboard’ release. A cheap cardboard box (surprise!) with two lenses and holder for an Android phone. From there a platitude of VR experiences are available to download, the vast majority being free and quite high quality. As Michael mentioned many were 2D music videos, utilising the low production costs of monoscopic VR to explore how it feels. Quite frankly Cardboard feels like a budget solution to the real deal, but once upon a time TV’s paled in comparison to movie screens. Now how often do we watch movies away from home? For $5 it was uncomfortable to wear for any long period of time, and looks predictably ridiculous, but I was amazed at the sense of presence granted nonetheless. In particular Google’s own art gallery explorations and Google Maps offered a high quality view of some amazing architecture, complete with narration and the ability to click through at your own speed. The ability to linger in an environment and appreciate it is unique to interactive experiences such as video games, and feels like an extraordinarily natural progression here. Perhaps virtual holidays or such could offer the same potential to provide a mind-space of sorts. The other primary method of experiencing these accompanying works would be through cinemas such as the one I went to. Presently there are several small VR cinemas or interactive play-areas, with other big players seemingly interested. IMAX is currently rolling out serious interactive VR areas, in addition to smaller non-interactive cinemas on a worldwide scale. Reportedly Village Cinema’s is also interested in exploring this field too. How much public demand there is however remains to be seen - while VR is fascinating for a multitude of reasons its ‘future-ness’ may not be enough to catapult it into the forefront of entertainment. “So much money is being thrown at VR right now that it might be anathema to experimentation,” says Ana Serrano “you’re less likely to fool around with the riskiest proposition”. And in order to find the creative language to drive VR filmmaking, creators need the freedom to explore.